I’ve just completed adding some new formats for my recent eBook “Getting Started with SharePoint Online for Enterprises”. Apart from PDF you’ll now find that title available in both ePub and Kindle format for the same price. Given that success, I am going to start working back through my previous titles and also convert these so stay tuned. Look out for a new title on Lync very soon! Following on from the very successful Desktop to Cloud event recently in North Ryde, I am happy to announce the commencement of the Desktop to Cloud User Group that will meet once a month in North Sydney. The idea is to have a regular forum where we can continue our discussions and discoveries around the latest in desktop and cloud technologies. The group is open to anyone, whether you are an end user, and IT Professional or a business owner looking for more information about the direction of technology. In the meetings you’ll hear from many experts and you’ll also get the opportunity to network with them. I’ll use http://www.desktoptocloud.com.au/ as the main landing place for information about the user group and the Desktop to Cloud event. It is fast becoming apparent that the concept of ‘downloading’ is a thing of the past. This video from Hungry Beast gives you the reasons why. <img alt="" src="http://lh5.ggpht.com/-xuMe3u-w28E/UOEWFWdquaI/AAAAAAAAGfU/n75nn51kHJo/video6abb1fce43be.jpg?imgmax=800" galleryimg="no" onload="var downlevelDiv = document.getElementById('347ade4a-6c22-46a5-bb3d-44e8eacac079'); downlevelDiv.innerHTML = "
This set of circumstances has been reinforced by two recent services. The first is Spotify which has finally made its ways to Australia. It basically allows your to stream music directly from the Internet no matter where you are. Not only can you access millions of tunes you can now access these on just about any device that is connected to the Internet including PC, MAC, iPhones, iPad, etc. There is even an option to store some of the music locally to take with you when you don’t have access to the Internet. Best of all you can start using the service for free! Upgrades provide more features but again access to millions of tunes for free that you don’t have to download – Brilliant! I’ve talked before about how I have been a member of a DVD video rental library for a while now. The idea is that you pay so much per month and they keep sending you DVDs in the mail. You simply watch and return them. This model has fast become out dated and businesses like NetFlix in the US are providing streaming of movies directly to devices. Such streaming services were unavailable to Australia until just recently. Quickflix (of which I am a member) has now released an app for idevices that allows you to stream movies and TV shows directly. The choices, I admit, are somewhat limited but they are growing rapidly. In the couple of days since I have had the service I have already watched a few movies. It is just so convenient. At this stage I would still like to get the content from Quickflix onto my aging TV rather than on the small screen of my iPad. I know that I can do so from the iPad but what I am really after is the ability for streaming Quickflix content to be delivered to my TV via my XBox which is always connected to the TV. The good news is that service is coming soon, not soon enough if you ask me, but in the meantime I can still stream movies to my iPad, PC or MAC, so I’ll survive. With Spotify and now Quickflix streaming we are again seeing a shift in the technology landscape. Sure you’ll need faster broadband connections and bigger download limits but I can’t see these actually getting smaller can you? I think that the concept of download limits here in Australia will disappear as it has in the US. The ability to access a service anywhere, anytime and immediately is certainly here to stay thanks to services like Spotify and Quickflix. Since the last podcast with Alan Burchill the number of downloads for my podcast has skyrocketed to almost 1,800 this month and the month isn’t even over yet! Amazing. Who would have ever though? Hopefully those numbers will continue with the addition of the latest episode. I am always looking for guest to appear or suggestions for topics would be interested in hearing about, so don’t be shy, drop me an email and let me know (director@ciaops.com). I have now completed another new e-Book called ‘Getting Started with SharePoint Online for Enterprises’. The cost is again only USD $1.99 and it contains over 40 pages of step by step tutorials, with screen shots, on using the SharePoint Team Site that comes with Office 365 Enterprise plans (E SKUs). This makes it a perfect document to either use if you are new to SharePoint Online or if you have customers looking to understand what SharePoint can do in Office 365. Even though SharePoint Online is very similar between the two offerings there are enough differences to make it confusing and therefore the need for two separate books in my opinion. Both cover the same information, however things such as the look and feel and what SharePoint components are available by default vary between the plans. So select the eBook that matches you plan if you want to get the most from it. My next eBook project will most likely be a set of tutorial around using SharePoint Online for each plan. If you have any suggestion for what sort of information you’d like to see in an upcoming eBook on Office 365 or SharePoint Online please contact me (director@ciaops.com). As mentioned in yesterday’s blog post I have now completed a new e-Book called ‘Getting Started with SharePoint Online for Small Business’. The cost is only USD $1.99 and it contains over 40 pages of step by step tutorials, with screen shots, on using the SharePoint Team Site that comes with Office 365 Professional and Small Business (P SKU). This makes it a perfect document to either use if you are new to SharePoint Online or if you have customers looking to understand what SharePoint can do in Office 365. Make sure you check back with my online store (or this blog) real soon as the next publication I am working on is ‘Getting Started with SharePoint Online for Enterprise’. I have been working on a new e-book that provides a tutorial on ‘Getting Started with SharePoint Online for Small Business’ and I was struck by how poorly SharePoint has once again been promoted by Microsoft. 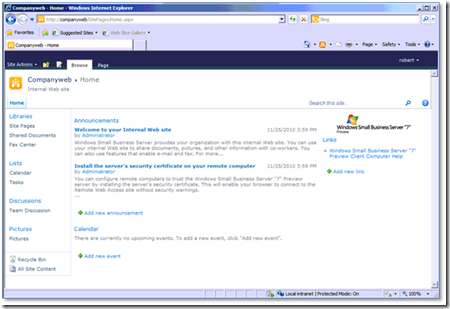 To explain what I mean take a look at the ‘default’ SharePoint version on Small Business Server 2010 (i.e. Companyweb), which many small businesses have seen. Here’s you’ll find Shared Documents, a Calendar, Tasks and a Picture library. In contrast have a look at what you get the Office 365 Team Site for the Professional and Small Business versions (P SKU). All you basically get is a page with a Posts web part and a single document library. Every other feature has to be added manually. Given that most people coming to Office 365 have probably never seen SharePoint having such a bland page, devoid of simple features like a calendar, wiki, contacts list does the SharePoint product no justice in my eyes. Many will look at it and wonder what it is for. Others will simply use it as a place to save documents without utilizing any of the features that sets SharePoint apart, like, sorting, filtering, views, meta data, just to name a few. 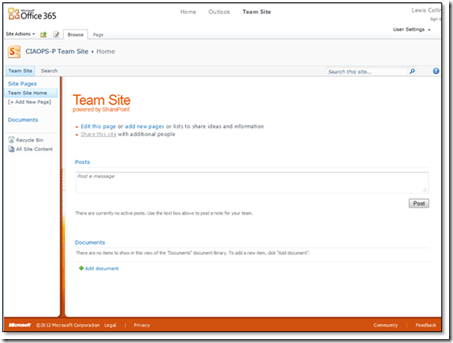 To me it would have made much more sense to provide a standard Team Site for SharePoint Online for the Professional and Small Business version. This Team Site has many of the standard features already exposed and ready for use. I’d pretty much bet that most people using this version of Office 365 would make use of a shared calendar at the very least. My guess would be that Microsoft used this Express version of the Team Site to reduce the complexity and make it simple to users new to SharePoint but honestly I think that it actually going to achieve the reverse. It is going to make them shy away from using SharePoint because they can’t see many of the features. To me it makes more sense for the items to be there and not be used than to be hidden from users who would have no idea that they even exist and how to go about adding them. Keep you eye peeled for the next blog post where I’ll provide you with the information about my new e-Book (for only $USD 1.99) that provides a basic tutorial on getting started with SharePoint Online. You’ll find it my online bookstore along with other SharePoint titles and tutorials. I certainly hope that people using Office 365 take the time to delve into SharePoint to find out how powerful it is but honestly Microsoft have not made it easy or enticing have they now?